Pop-Tarts® are a flat rectangular toaster pastry first created by accident during the Manhattan Project. They are possibly the most dangerous breakfast food item ever introduced in the major market, with a 97%-uranium filling vacuum sealed between two layers of medium-density fiberboard, which makes them the ideal fuel-source for nuclear generators. On the top is usually a thin layer of frosting, made from either the blood of a virgin or the saliva of the three-headed canine guardian of Hell's gate, Cerberus (depending on what flavor you buy). Sometimes it's both. The main ingredient is evil. They are usually sold in pairs inside packages made of human flesh. Frosted Pop-Tarts® are not suitable for vegetarians, as they contain gelatin. At first, Pop-Tarts® were not frosted because it was believed that the frosting would melt in the toaster and result in nuclear criticality. However, the Russians discovered that the frosting could survive the toaster in what is now known as "RDS-1". 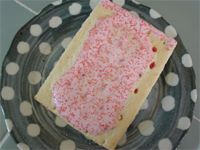 The first frosted Pop-Tarts® were released in Leningrad in 1950 under the name Red Squares. This is because in Mother Russia, tarts pop you. Since their creation, Pop-Tarts® have served as the epitome by which all not-nice things are measured. Pop-Tarts® may look and taste edible, but actually slowly kill you from the inside out. The CIA theorizes that the Weapons of Mass Destruction they were looking for might be Pop-Tarts® or at least Pop-Tarts® are a key asset. Pop-Tarts® are Kelloggs' most popular brand, selling more than two billion Pop-Tarts® each year. For tax reasons, Pop-Tarts® are considered to be cookies and should always be pronounced as a plural, never "Pop-Tart" or "Funtangle" in the singular form. They are distributed mainly in the United States, but are also available in the United Kingdom, Australia, and Hell. Microwave on high setting for 3 seconds. Heaven forbid you should microwave Pop-Tarts® for four seconds, lest you wish to taste hellfire and brimstone. Remove the Pop-Tarts® from their flesh wrapper. Place the Pop-Tarts® (this is very, very important) vertically within the toaster. The consequences of placing it horizontally can be dire. 98.6% of people who placed Pop-Tarts® in horizontally have died. The other 1.4% refuse to speak of the unimaginable horror. Toast the Tarts on the lowest possible setting, approximately 2 F for one minute, so the heat may spread all along the interior, and so the filling will still be boiling hot when you bite down on it, thereby leaving your mouth burnt and scarred forever. Remember, Pop-Tarts® need very little toasting, as they generate their own heat via nuclear fusion deep within their core. When you are done heating your Pop-Tarts®, enjoy the memory. This may be the last time you eat ANYTHING. Immediately proceed towards the bathroom and sit promptly on the toilet (make sure the seat is up). Because Pop-Tarts® can easily reach absolute zero in a freezer, and because absolute zero tastes awesome, Pop-Tarts® may also be eaten frozen. A brand of Pop-Tarts® specifically made for eating frozen was introduced for a short while, but the brand was quickly recalled by the FDA due to reported cases of mercury poisoning...which was somewhat odd, as mercury wasn't on the ingredient manifest. It was, however, available as a flavor. Pop-Tarts®, throughout their history, have been found to have other uses. For decades, they were used as an emetic (a substance used to induce vomiting). They also doubled as a laxative for a short period of time before they were reformed and made more digestible (Neo-Pop). When melted down, Pop-Tarts® can be used to run a car. This unnamed fuel may release more pollutants and corrode the interior metal components of the motor, but has proven itself more efficient than premium brands of gasoline. 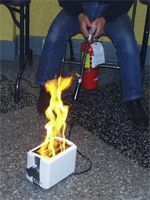 Due to their combustibility, Pop-Tarts® can also be ignited and used as powerful explosive devices. If left out after heating, Pop-Tarts® take on a very dense and hardened form, making them very convenient for use as crude bladed weapons, or as throwing stars. It is for all of these reasons and more that Pop-Tarts® are metaphysically bad for you, and are not safe for human consumption. This page was last edited on 9 October 2012, at 00:04.